The KB17 curatorial section mentions, apart from Amin Gulgee, members of the curatorial team, both local: Zarmeene Shah, Zeerak Ahmed, Humayun Memon, Sara Pagganwala, Adam Fahy-Majeed and international: Paolo De Grandis of Venice, Carlos Acero Ruiz of Santo Domingo and a team called SPARCK with individuals from Paris and Capetown. The artists are too many too list here. They are said to number 'over 140.' The largest number of them, 44, show their work at the impressively large building of the NVJ School, both the main and opening location for the event. The guide has a daily program for scheduled performances and the screening of a movie. At the end there is a section 'KB17 Dialogue' with a list of speakers featuring in the program, nine in total: Savita Apte, Saquib Hanif, Dr. Marek Bartelik, Carlos Acero Ruiz, Adriana Almada, Dannys de Montes de Oca Moreda, Dr. Marcella Sirhandi and Paolo De Grandis. 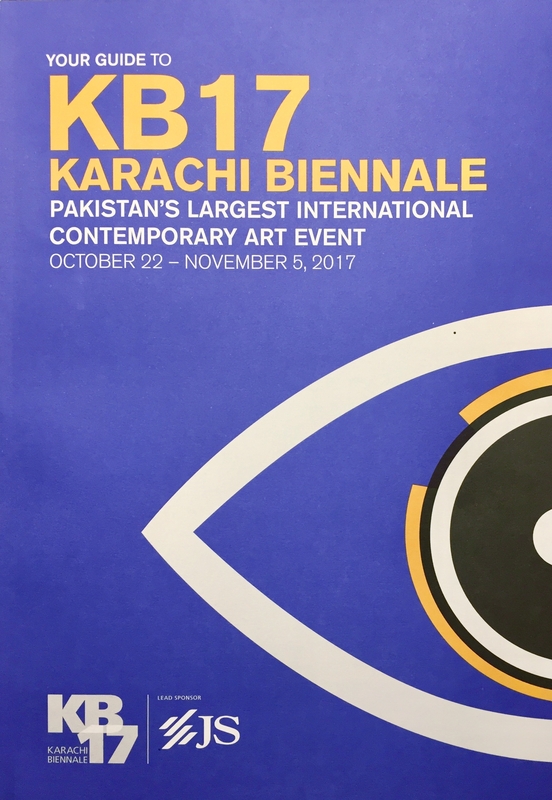 Then there is a section about the KB17 prizes, one juried and one decided on by the public; a section about 'the making of' KB17' with a list of events organised by the team in the past two years leading up to the biennale itself. Then a section 'Reelonhai' about a public art project intended to reach out to more areas of the city, which lasted from June 2016 until KB17. It involved discarded cable reels, which were turned into works of art. The guide has a list of all locations where the wheels can be seen and the artists who transformed them. Finally there is a 'who we are' chapter with an impressive list of all patrons and - so many - collaborators.